After much speculation and some sneak previews of the mock-up, we finally get to see the new XF range of cams from Canon. Maybe not quite what some people were hoping for.. but, some seriously good features. The L-Series lens looks like it might be very impressive and the tech spec is very nice... 4:2:2, 50Mbps, Variable frame rates....and CF card storage. The XF300 is a slightly slimmed down version of the XF305...it loses the SDI output, the timecode and the Genlock... no biggy for lots of you just shooting with the one camera. Canon have obviously been listening to us, because not only do we get a decent data rate and 4:2:2, but the focus ring and zoom ring both have end stops... a good move. The retail price of the XF305 is going to be $7999.... so the XF300 will be a bit less and we'll probably get stitched up in the UK and have to pay way over the £6k mark.. but you never know. The XF305, one of Canon’s first file-based professional camcorders, combines an MPEG-2, 50Mbps, 4:2:2 codec with a Canon L-series lens, 3 Full HD CMOS sensors and studio connectivity for superb HD video stored on CF card. 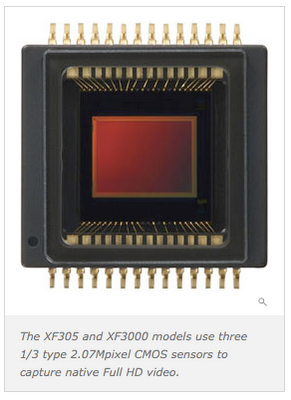 The XF305 records MPEG-2 MXF (Media eXchange Format) files – up to 1920 x 1080 Full HD at 50Mbps (4:2:2) – to CompactFlash (CF) memory cards. 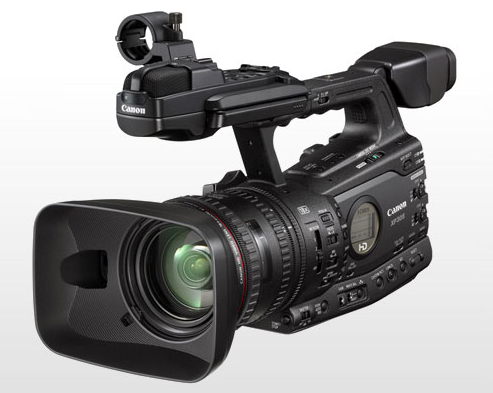 CF media is inexpensive and widely available: dual card slots allow filming to continue without interruption. 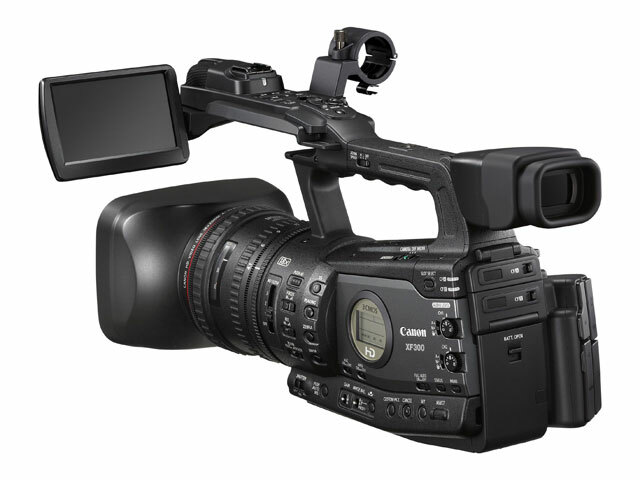 Drawing on Canon’s broadcast lens expertise – and informed by the feedback of professionals – the lightweight 18x L-series HD Video Lens delivers superb optical quality. Unique Ultra-Low Dispersion (Hi-UD) elements are used to prevent chromatic aberration. Separate rings offer independent control of Focus, Zoom and Iris (F1.6) – with full manual control available, end stops are provided for the focus and zoom rings. Full HD at 1920 x 1080 resolution is captured via three 1/3 type 2.07 Megapixel Full HD CMOS sensors – designed and manufactured by Canon in-house. High speed scanning minimises the effects of a rolling shutter. The 10.1 cm (4”) LCD screen can be positioned either side of the camera. Offering superior resolution (1.2M dots), the Focus Assist tool helps achieve sharp images. A built-in Waveform Monitor (WFM) helps verify exposure and other shooting parameters. Alternatively, a 1.3 cm (0.52”) Electronic Viewfinder (EVF) is available. HD-SDI output is the industry standard, outputting uncompressed Full HD with embedded audio and Timecode. Genlock In and Timecode In/Out allow the XF305 to be used in a multi-camera shoot. Audio can be captured via twin XLR inputs and also with the front-mounted stereo microphone. Twenty-six Custom Picture options can be adjusted to achieve the perfect look. These can be stored in-camera – via SD card - and settings can even be transferred between camcorders. Do you think the images will look as nice as a 5D Mk2 with a L series lense on it? The 1/3 sensors will reduce the DOF somewhat. I'm very excited I can'd wait to see some footage shot with them! Is there any getting about? I think it's out in June Scott...but there's bound to be a demo model around sometime soon. I can't see the images matching the 5DMk2 or the 7D or 550D to be honest. 1/3 chips are just not going to give you either the DOF or the low-light capability. But... i don't think Canon would have invested the time and money into this cam without knowing their market. So maybe this is the perfect partner to a DSLR? DSLRs are great for shots which are planned and set up...but not so good for 'run & gun' or fast paced action shots. Maybe the XF cams can fill that role? Should be very interesting to see what an 'L' series lens can do with 4:2:2 and 50mbps. As soon as there's some footage...i'll post it. DVD Studio Pro nightmares...and mpeg2 woes..
New AVID DSLR news..and more.